These last images were taken throughout our trip, but didn't really fit into any of my previous posts. 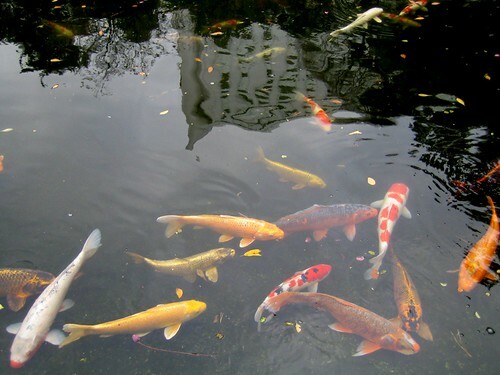 Some are beautiful, some are funny, and some just epitomize some aspect of Japan to me. Reflection in the koi pond at our first (and favorite) hotel, The Prince Sakura Tower in Shinagawa. Pretty typical Tokyo street fashion: short skirts, over the knee (or thigh) socks or boots, and brightly colored high heels. 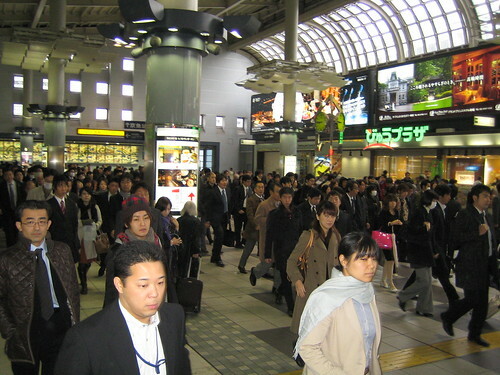 Many, many people in Japan wear masks to protect themselves from illness. This little girl, in her school uniform, had a knit mask on. Hard to understand how that could be in any way effective, but she sure was cute. A perfect example of the reason things make me all wanty in Japan. I mean, come on! How cute are these?! 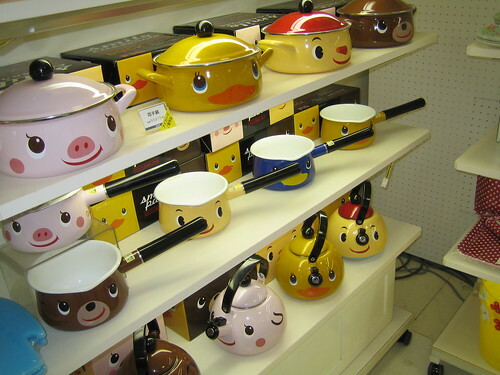 Just seems like breakfast would be a lot more fun if it was cooked in these pots every morning! 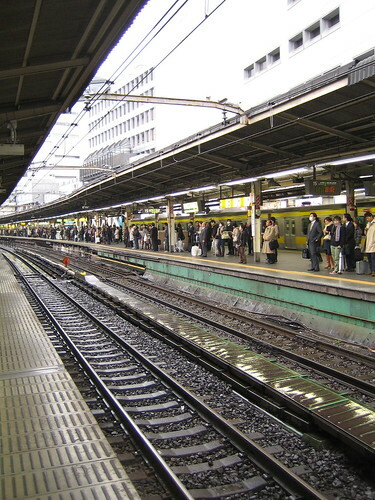 The very efficient JR (Japan Rail) system. Loved it. We never waited for a train more than a minute or so, no matter where we were going. The thumbs up from my seasoned traveller. I wish I could have snapped more pics of the shoes I saw on the street. Most were much flashier than these, but the style here is so unique. 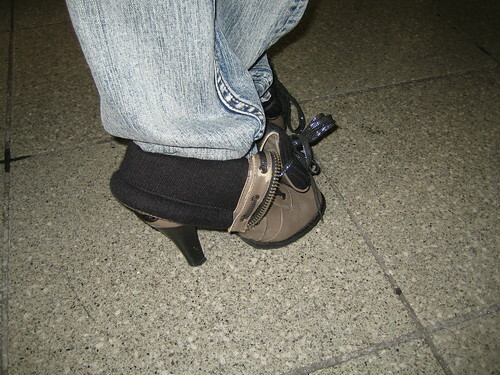 Heel height typical. While in Tokyo, I got a massage at our hotel spa. I just love the wording on the contract I had to sign, especially the "escape clause". It all seems perfectly reasonable, I was just tickled by the translation. A beauty in the lobby of our hotel in Kyoto. Our hotel seemed like a popular place for weddings, so we got to see a lot of beautiful kimonos and the like there. 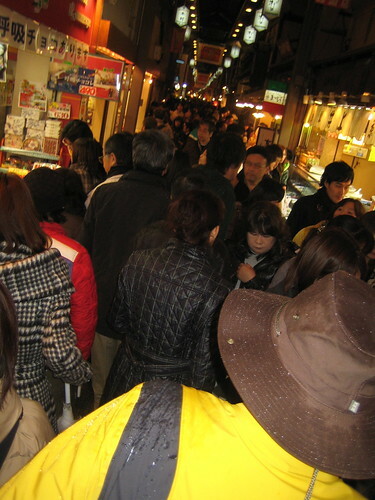 A view of one of the covered markets in Kyoto. We stumbled upon this one our first night there and just loved it. It's basically a narrow street that has been covered for a span of several blocks and is crammed with stalls full of fresh fish, produce, sweets, and a few restaurants. 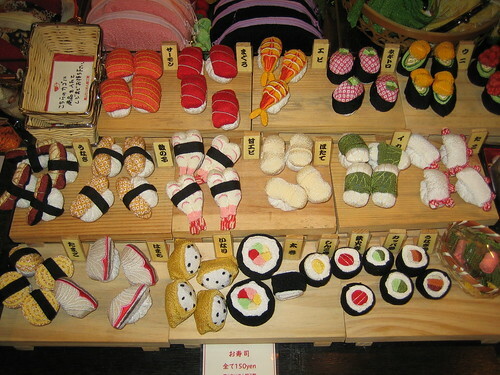 Cloth sushi from one of the stalls in the market above. 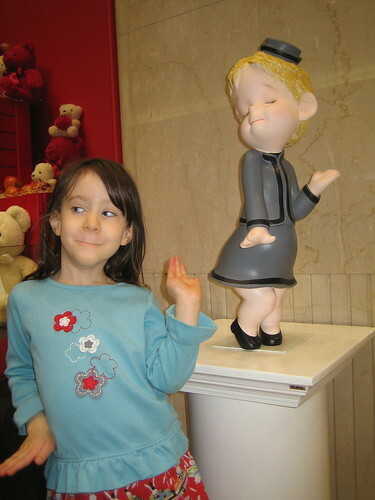 Ever the ham; this time at a Christmas display in a department store. 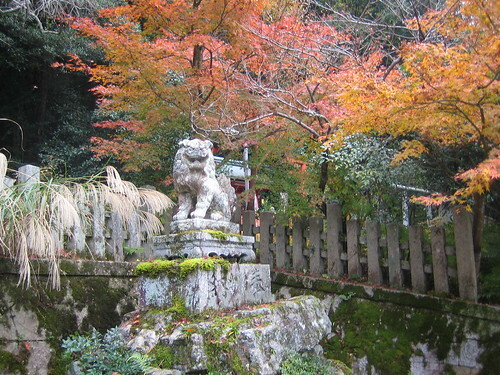 Guarding a temple in Kyoto. 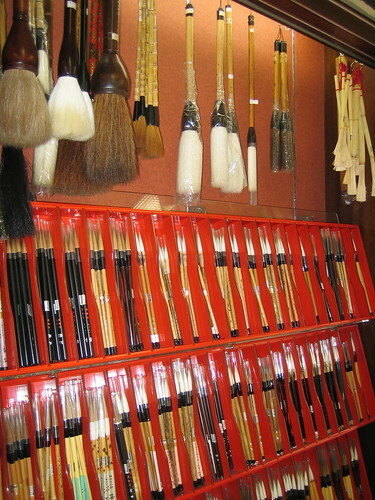 One section of a tiny shop in Nara that sold nothing but brushes. 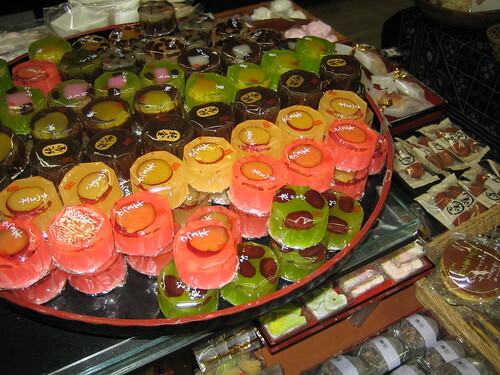 Beautiful treats at a shop in Nara. 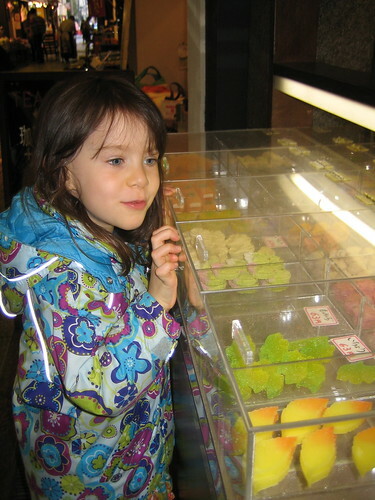 Anna fell in love with the tiny candies they serve at tea ceremonies. Made of rice flour and sugar, the are sculpted into beautiful flowers and leaves. 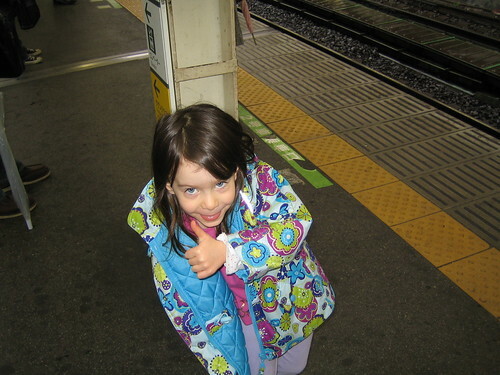 Here she finally convinced me to buy her one as a treat for the train back to Tokyo from Kyoto. Smart girl! As always your pictures are amazing!